It's suddenly spring-ish, and time to wash our woollies. I always try to do a wash of our mitts, hats, etc. before tucking them away for the summer. I love the moment where all of this hard work, these handknits and handspun garments, are clean and dancing in the warm breeze. A good once-a-year image! 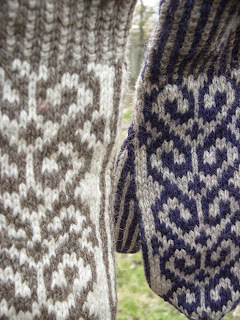 Here's a close up of two different pairs of Due North Mittens. These are variations on The Hole Inside Mitts. The one on the right is all handspun, hand-dyed purple and natural brown finnsheep wool. Here are the special order handspun mitts (placed last fall by a twin with a fondness for a special flock of sheep!) with a stripe from Margaret's Shetland gray wool. These show hardly any wear, but sadly, will likely no longer fit the twin in question in the fall. What else was on the line? Handknits/handwovens by Didi (the twins' grandma), Slippy the cowl and some gorgeous green wool scarves from Ireland, used for wrapping up preschoolers' faces when it is -40 out.